Black and Orange Halloween Invitations. Decorations. Favors. Celebrate Halloween with a Black and Orange Ball that your chic friends will love! Dress up your whole party space in sophisticated black and orange for a Halloween soiree your friends will never forget! 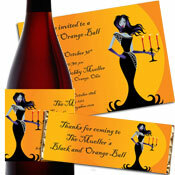 Set the mood for your event by sending a classy personalized Halloween Ball invitation! Let your guests know that this is a "black (or orange) tie affair", so they come in their black or orange best. You can also turn your Black and Orange Halloween Ball into a masquerade by sending a black mask with your invitation. Mail them in padded envelopes or hand deliver them. Give your invite a chic black wax seal on each envelope. Guests won't miss this lux detail! Or you could tie your invite with an elegant black satin ribbon. Add some black star confetti to the envelope for a sparkly touch. Welcome guests to your ball with a personalized Halloween ball banner above your entrance! Guests can sign a pumpkin instead of a traditional sign-in book. Make sure to have someone hand out party wearables as friends arrive - sequin masks, feather boas, and even black top hats would be fun! Lower the lighting for a romantically spooking setting, and set black candelbras where guests like to lounge. Orange lighting throughout your party space will set the mood! Place black artificial rose bouquets in vases throughout the room with a few orange led flicker candles around each one. Orange and black lanterns look incredible hanging from the ceiling and cast a soft glow on your guests. And, we would add black and orange balloon bouquets throughout the party area. Use a pumpkin as a balloon weight! Set the mood with soft spooky classical music playing in the background. Try a few of these selections, and everyone will be toe tapping in terror! Mozart - Requiem "Dies Irae"
You'll want to choose more upbeat music once guests hit the dance floor, but this playlist is perfect for the cocktail hour and dinner. If you're having a more formal ball, choose black linen tablecloths with orange linen napkins. A black lace overlay would add to the elegant look. If you're going more simple, then the black or orange paper goods will make setting the table easy. (And easy to clean up!) Place a few candelabras down the middle of the table, and sprinkle orange and black confetti. Float candles in clear containers. Tint the water orange! Place black and orange glitter skulls on raised platters with a few pillar candles to make a beautiful centerpiece. Arrange black painted branches in tall vases and hang bats, black crystals, and hanging candles from the branches. Set a tall candlebra on each table for a quick and easy centerpiece that has big impact! Arrange black and orange ostrich feathers in vases for a tall centerpiece that will fill a large ballroom. Add orange led lights to the bottom of each vase for extra glow! The food at your Black and Orange Ball should be elegant and chic! If you're serving a sit down dinner, stunning entrée such as rack of lamb or beef tenderloin. Serve autumn dishes like sweet potatoes and roasted squash on the side, and devils food cake for dessert. Hors d'oeuvres and cocktails are fun in lieu of a formal dinner. Whip up some Halloween recipes that are great to put on trays and pass around. Stuffed mushrooms, crudités platters with assorted dipping sauces, crab cakes, cheese and crackers, hot artichoke dip and other appetizers are appropriate. Combine vodka, pumpkin and orange juice in shaker with ice, shake well and strain into the glass. Garnish with black liquorice. Set up a dance floor with orange lighting. Orange Halloween spotlights that cast webs, bats, and pumpkins are perfect! A fog machine on the dance floor is a must. Guests will be dressed in their Halloween best! Set up a photobooth area with a photographer to take professional couple's pictures, or make it more fun with a black sequin backdrop and a bunch of Halloween photo booth props! Rather than a more conventional costume contest, have guests vote for a Black and Orange Ball King and Queen! Of course, everyone votes for who wore the most elegant costumes. Announce the winners and have them share a dance along with the rest of your guests. Set up an all-black and orange candy buffet! Guests fill a halloween ball favor bag with gummies, foil wrapped chocolate, licorice, lollipops and more. Just make sure everything fits your orange and black color scheme. Have your dj hand out glow jewelry and dance floor led light ups to get the party started! Guests can take these giveaways home as favors, too. You may want to send your friends home with a little treat or else you might get tricked! A bottle of champagne or wine with a personalized bottle label that matches your invitations is a classy choice. Many companies release special edition Halloween wines and champagnes for you to choose from. Everyone will be toasting your party planning skills, and waiting for your next fabulous event!